Sunset Shores - One house off the beach! Welcome to Sunset Shores in La Jolla. Sandy beaches, grassy parks, palm trees and Pacific Ocean views are all here for you to enjoy a true San Diego Beach experience. Located in the highly desirable neighborhood of La Jolla Shores, Sunset Shores sits just just a short stroll from the grass lawns of La Jolla Shores Park and the Pacific Ocean. 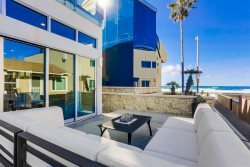 La Jolla Shores features beautiful wide, soft & sandy beaches and is located close to the Village of La Jolla and many of San Diego’s most beautiful attractions. The home boasts five bedrooms with an additional sleeping area in the den and can sleep up 10 - 12 guests.This home is very accommodating and is the quintessential California beach house with a casual feel, open beam ceilings, great wrap-around ocean view deck and even a hot tub!. The nicely updated kitchen has everything you’ll need to prepare your favorite meals for in home entertaining and dining. Many guests take advantage of the BBQ and either eat in, or pack a picnic and head over to the beach. Neighborhood markets, beach shops and rentals plus several restaurants are all within walking distance! At Bluewater Vacation Homes, our most important job is to help you find the perfect home for you and your group. Our vacation planners are local area experts and here to help you plan your activities to make the most of your stay. Once you arrive, we're available 7 days a week to make sure you have an exceptional experience. Please note: No pets and no smoking allowed. This home is located in a high-density residential neighborhood and is only suitable for quieter groups. We enforce a no tolerance policy regarding noise that disturbs neighbors, over-occupancy and/or parties with rent forfeitures and evictions. Please make sure you are comfortable with these policies before booking with Bluewater Vacation Homes. Bluewater Vacation Homes was great! They were very, very responsive. There is nothing I could criticize. The location was fantastic, but the house itself was also wonderful. I could not criticize anything about it! It exceeded our expectations! Bluewater Vacation was a great company to work with. They helped me find the best home for our trip. They were available for any questions and concerns before and during our stay. Great communication. Plus they also gave me personal recommendations for things to do and places to eat. Very easy to book a home for our summer vacation! This home was great. We had enough space for 2 families with teens. Great ocean view from deck,great place for morning coffee. So close to many attractions. Driveway parking and it really fit our needs. Loved the quiet area of La Jolla! We felt more like a local then a tourist here. Many upgrades/modern home! Great home, one block from the beach. Slept 8 adults and four children. Home is in very good condition. Kid safe upper level deck overseeing the beach and ocean. Please note: No pets and no smoking allowed. Parties, over occupancy or any noise that disturbs neighbors is absolutely prohibited. This home is in an multi-family complex and is only suitable for quieter groups. Furnishings and amenities are subject to change. All occupants and use of home must be approved by owner or management and reservations may be declined or canceled at owner or management's discretion. All rates are subject to change until finalization of reservation. Please make sure to read the contract terms and conditions closely and are comfortable with these policies before booking a reservation.